That word may conjure images of 7th Grade English, scribbling at your desk in frustration while a stern teacher looks over your shoulder as you try to learn how to outline. A book outline can be almost as intimidating as that teacher’s blatant glare. Many of us learned how to outline in middle school, and it’s a skill we haven’t revisited since our braces came off and the acne faded away. But have no fear! You’re a grown-up now, and this project isn’t being graded, which means learning how to outline a book can (and will!) be pain-free, especially with the right help. You have free reign to structure your book outline to benefit your writing process—whether that’s a spaghetti-on-the-wall approach or a color-coded Excel spreadsheet. Us at Self-Publishing School? We love this tried-and-true Mindmap to Outline procedure. Your life is busy and sometimes you want all the (book-related) goods in one place. We heard you – and we listened! Chandler Bolt created this all-in-one exclusive training for serious soon-to-be-authors. If you want to learn how to outline and everything else about the book writing process, make sure to sign up to save your spot! Because if you want to learn how to outline, you may as well get as much information as you can right away. Trust us, it’ll make your writing process that much easier. Click the button below to sign up and save your spot! Get started on your path to published author by learning from 6-time bestselling author, Chandler Bolt, and uncover his best-kept book writing secrets that have led him to grow 7 figure business. What is a Book Outline? A book outline is a roadmap or blueprint for your story. It tells you where you need to go and when in chronilogical order. It’s easy to see this term and wonder exactly what that means. Is it a bullet list of topics for your book? Is it a chapter by chapter overview written in paragraphs? No matter how you write an outline, the purpose is the same. Think of it as a GPS of sorts but instead of giving you driving directions, your outline will give you writing directions. Why Should I Write a Book Outline? No matter which type of book outline you choose, planning before you write has many benefits. It’s not just about getting your thoughts on the paper, either. It’s about so much more than the actual writing. You don’t need to spend huge amounts of time learning how to outline a book, but some (mostly painless!) prep before writing will be time well-spent since you won’t be spinning your wheels by staring at the blank screen of death. When you start with a plan, you’ll unconsciously make connections and think about your draft, even when you’re not actively writing. Mentally writing in the shower is one of the perks of outlining, because it will get your thoughts percolating. Be sure to keep paper and pens scattered about so you can capture your brilliance the minute it bubbles up, rather than letting all those ideas fade away. Once you have a plan to write your book in outline form, you’ll be better able to put these thoughts to paper and compose your chapters when you do sit down to write. This means a finished book in less time! And I have some good news: there’s no “right” way to outline. Each writer will have their own process that’s personal to them. Keep reading for tips on how to outline different ways. If one of these exact methods doesn’t strike a chord with you, you can combine methods to create your own way that works best for your unique book. Are you writing a fiction or non-fiction book? Depending on which you’re working on, the outlining process may look be different. Thankfully, there are plenty of relevant tips you can apply in the section about outlining a non-fiction book. Likewise, even if you’re writing non-fiction, the section on how to write a fiction outline can help spark some ideas for your process, so we recommend authors of all types of books read the full list. NOTE: We go in-depth with everything covered in this blog post along with the writing, marketing, and self-publishing process in our VIP Self-Publishing Program. Most non-fiction authors find outlines useful due to the nature of their books. Generally, works of non-fiction require research and citation of sources (although many novels require their own research!). An outline can help organize your research so it doesn’t overwhelm you, plus your outline will help you create the best structure for your finished book. These are some of the beneficial methods we recommend for you. This is the main method of outlining that we teach in Self-Publishing School. The mindmap method requires you to create a brain dump based on your book’s topic. Write your topic in the center of a piece of paper, then use lines and words to draw as many connections as you can. It doesn’t need to make perfect sense from the get-go—the goal is free-form thinking to get all of your ideas out of your head and onto the page. You’ll start to notice connections between different categories of information. This makes it easier to spot the relevant “book-worthy” ideas. Then you can pluck those ideas out of your mindmap and put them into a cohesive book outline. We also recommend doing a mindmap for each chapter you select from your original mindmap. It will help you structure your entire book chapter by chapter. Fun, and so easy—we told you this would be (mostly) painless! At Self-Publishing School, we encourage students to make a mess with their mindmap. 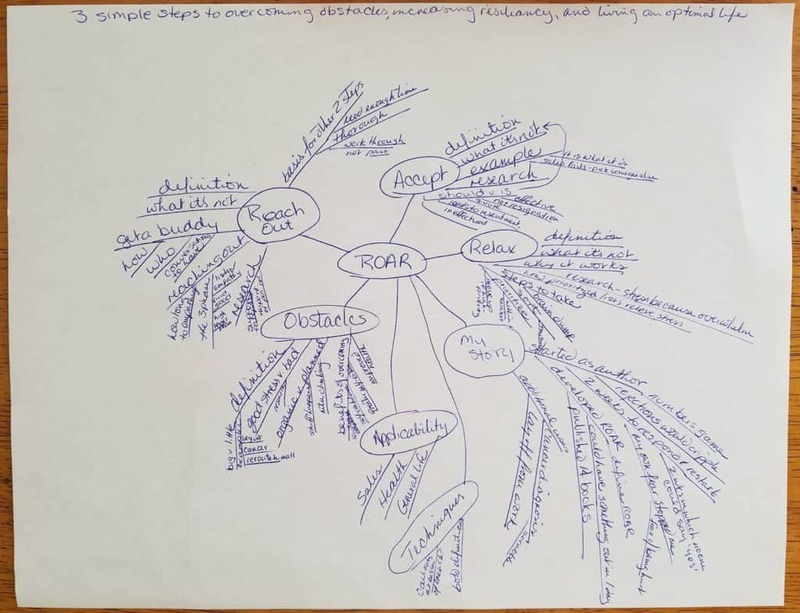 Regardless of what your mind map looks like in the end, it is an essential element to your book writing process. A simple book outline is just as it sounds; keep it basic and brief. Start with the title. Don’t get too hung up on the perfect title at this stage of the process; you just want to come up with a good-for-now placeholder. You can always change the title later—in fact, you probably will—but starting with some kind of title gives you a better idea of where you want your book to go. Plus, outlining your book this way jump-starts the creative process. Next, you’ll list all of the key points that cover your book’s overall theme and message. You’ll use these key points to generate your notes. Later, you’ll flesh out these notes to draft your book chapters. Your chapter-by-chapter book outline is a pumped-up version of the simple book outline. To get started, first create a complete chapter list. With each chapter listed as a heading, you’ll later add material or shift chapters around as the draft evolves. Create a working title for each chapter, and list them in a logical order. After that, you’ll fill in the key points of each chapter. Finally, you’ll link your resources as they would appear in each chapter, including books, interviews, and Web links. Perhaps you find the idea of a written outline confining. That’s OK — there’s another option which might appeal to your artistic side. Dan Roam, author of The Back of the Napkin: Solving Problems and Selling Ideas with Pictures, wrote about how sketching your ideas can simplify complex thoughts. To create this type of book outline, hand-draw your book concept in sequential order. This may be as simple or as elaborate as you desire. Feel free to use a Bic pen and a spiral notebook, or take it to the next level with a color medium on canvas-sized paper. The great thing about drawing your book is that you can later use the images as promotional and marketing material! If you like being uber-organized, then the writing software Scrivener might appeal to you. Their book outline program allows you to upload your research, organize it by moving it around, and filing it into folders. Like many writing software programs, it does have a fairly extensive learning curve, which can be a major downside—especially if you tend to procrastinate and really want to get your book published quickly. However, some writers say it revolutionized their organizational process for longer works. You can learn more about the program and its uses here or check out this tutorial for an overview. While you can incorporate the book outlining tips we shared in the non-fiction section above, creating an outline for your novel will be inherently different from creating a non-fiction outline. While the methods may be different, the goal is the same—organization and pre-planning so that you can write a great, cohesive book much faster. Your goal with the Basic Document format is to use a Word or Excel table to give structure to your theme. Create a table and organize and summarize your key points and plot. You’ll then create a separate section for characters and themes, and an additional section with relevant research. This is for the creative mind, and another method we teach in Self-Publishing School. All you need is a blank wall and a box of Post-It notes. Carry a pad of Post-Its with you wherever you go, and doodle your book on the fly. Write your ideas and inspiration on your Post-Its when the mood strikes you. Next, affix the Post-Its containing words, snippets, doodles, and phrases to the wall. After a week of this exercise, organize these words into novel outline form. Voila—simple, effective, creative! The process of the snowflake method focuses on starting small, then expanding. For example, you’d start with one line from your book, then add a paragraph, then add a chapter. Since the snowflake method is fairly detailed and based on scientific theory, Randy’s article is worth a read so you can review the detailed steps involved in this outlining method. If you’ve ever written a term paper or thesis, then you’re probably familiar with the skeletal outline. You’ll lay out your narrative points in the order they’ll appear in your story, which involves a broad 7-step story arch. This gives you a big picture idea of the flow of your story, so you can adjust your story and add subplots for maximum impact. Why reinvent the wheel? If you’re impatient to jump right into the fun part—writing!—or you aren’t sure exactly how to format your novel outline, then a pre-formatted template outline might be your saving grace. A fill-in-the-blank novel outline can help you develop your plot, characters, and ideas without getting bogged down with the notion of striving for “proper” outline form. Sometimes looking at the problem from a different angle can give you the answer to the question. The same applies to outlining. Reverse outlining is exactly what it sounds like: Write down how your novel ends. Then once you know the ending, outline backward to get to that happy (Or sad? You’re the author!) ending. For more ideas and creatives ways to jump-start your novel outline, check out How to Write a Novel Outline. Discover what works best for you and you’ll be one step closer to a finished book. Ready to become a published author? Make sure to take advantage of this free training. It will take you through everything you need to go from blank page to published author in as little as 90 days! You’ll have your outline started before your training is even finished. Are you an outliner? What’s the best method you’ve used and how did it help you the most?